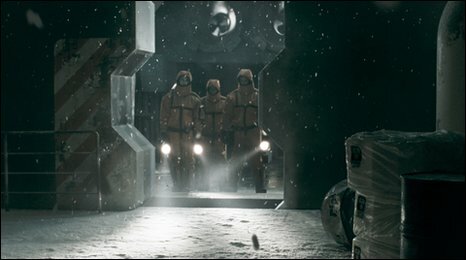 The first science fiction film to come out of Switzerland has received its UK premiere. Cargo - an atmospheric thriller set on a space freighter in the 23rd century - was screened on Monday as the closing film of the Sci-Fi-London film festival. Directed by Ivan Engler, Cargo sees the human race living on overcrowded space stations because Earth can no longer support life. The only hope of escape is making an expensive voyage to the paradise planet of Rhea which is five light years from Earth. Dr Laura Portmann (played by German actress Anna-Katharina Schwabroh) signs up for a lengthy journey on the rusty old cargo ship Kassandra in order to make the money to travel to Rhea, where she wants to join her sister. Early reviews have picked up on the film's portrayal of the tediousness of space travel, and its impressive visual effects. Ivan Engler talks about the challenges of making the film as a first-time director. What was the main challenge of making Switzerland's first major science fiction film? Switzerland does not have a big film industry, so we had to "invent" many things ourselves. There were no sound stages big enough to hold all our sets, so we transformed an old and derelict industrial building into a film studio, with workshops, offices, a staff canteen, props storage etc. Our budget was very limited (as a first-time director you only have access to limited state funding) so we had to find ways to be able to make the movie as "epic" as it is now. The key to this was that we were extremely thorough in pre-production. In post-production we put together a team of newcomers and rookies that we trained for the first four months - we were very lucky to find such excellent talent for Cargo. What other sci-fi films have inspired you as a writer/director? Ridley Scott's Blade Runner left a permanent imprint in my brain since I saw it when I was around 15. It is my absolute all-time favourite movie, followed by Akira and Alien 1&2. Next to that, I totally love the films of Michelangelo Antonioni (Blow Up / Zabriskie Point / Il Deserto Rosso) and of Andrei Tarkovsky (Solaris). One of the main reasons in Cargo for the hero's arrival on the beautiful planet Rhea was my desire to have a quiet moment of somebody in a park - as in Antonioni's Blow Up - where concepts of truth and fiction slowly start to dissolve. How big is the science fiction genre in Switzerland? The sci-fi genre was non-existent until Cargo. The only exception was the artwork of HR Giger. We were pioneers. What's been the reaction at film festivals? Of course the people that did not love the film did not come to me after the screenings! The ones that came loved the movie. I got spontaneous hugs from people who told me that Cargo was the film they had been waiting for. Whenever I see the film at festivals I have to curl my toes from time to time because there are still many moments with which I'm not happy! Science fiction was well-represented at the Oscars and at other film awards this year. Has that been an inspiration? Of course it is always nice to win any kind of recognition and awards. But my only motivation to make films is that I have an extreme urge inside of me to tell stories. I have to. If I cannot tell stories, I feel bad, unhappy, unfulfilled. What are your plans to follow up Cargo? I'm represented by Creative Artists Agency (CAA) in the US and they just sent me on a big tour to meet all the producers and studio executives. I am reading scripts at the moment and also developing my own stories. We will see where that all leads. I definitely want to make more sci-fi films in the future. The London International Festival of Science Fiction and Fantastic Film took place 28 April - 3 May. The Sci-Fi-London Oktoberfest takes place 14-16 October.